I’m writing this on a rainy Boxing Day in Scotland, having just enjoyed a wonderful Christmas Day. I see this as an opportunity to reflect on the last twelve months, and to get ready for the next twelve. I hope you’ll learn something new, discover some new music and find the next book for your 2017 reading list along the way. Back in January, I optimistically set myself the challenge of reading 25 books in 2016, and I’m thrilled to announce that this year I finished…five books. On the whole, I enjoyed all the following titles, and I’ll be aiming (more realistically) to finish 12 books in 2017.
round to reading it this year. The exposition on monopolies is good, and I like Thiel’s idea of “company secrets”. I’d recommend borrowing it from a friend or library rather than investing in your own copy. In contrast to ‘Zero to One’, ‘Quiet’ definitely did expand my horizons, and I would recommend it to everyone, regardless of whether you regard yourself as an introvert or not. I’ve always considered myself an introvert, and it’s something I’ve fought hard to change since high school. Though it may come as a surprise to those who know me now, I was painfully shy and afraid of small talk when I was younger. Though I’m now more outgoing, I still need alone time to recharge, and I much prefer small gatherings to huge parties. Susan’s writing helped me reframe my introversion (I am an “ambivert”, apparently) and gave me lots to think about when designing our work environment at Encore. If you’re introverted, this book will resonate with you. If you’re not, read this book to gain a deeper understanding of the quieter people in your life. The second half gets a little slow, but it’s worth persevering to the end. If I remember correctly, I finished this book in roughly three days. DHH and Jason Fried have built a unique work culture at Basecamp, and I’m glad they spent the time publishing their thoughts in a book for the masses. Refreshing, but not revolutionary, this is the sort of book I plan to read at the beginning of each year to avoid falling into bad habits. I’ve always had a lot of respect for Alexis Ohanian. Though he’s best-known for Reddit, he is also a great writer and has produced a fantastic “Small Empires” documentary series for The Verge. He’s passionate about helping other startups and their founders, and this comes across in “Without their Permission”. Maybe I have a bad attention span, but this is another book that seemed to lose momentum at the halfway point. The founding stories behind Reddit and Hipmunk are inspiring, and his ideas on changing the world are solid, but the political section is where it waned for me. Regardless — thanks for writing this, Alexis. I’ve saved the best for last. This is a book I’m recommending to absolutely everyone. “Ready Player One” is set in a dystopian 2044. Cline introduces us to Wade — a boy whose body is stuck on a dying Earth, but who spends every waking hour living in virtual reality — as he is thrown head-first into a quest for ownership of the Oasis (essentially the Matrix). We’re still decades away from achieving virtual reality as advanced as the systems described by Cline, but this book depicts a future that I believe we will eventually experience ourselves. As if that wasn’t enough, the plot is so good that Steven Spielberg is making a Hollywood adaptation set for release in 2018! Cline’s writing style sometimes makes you wonder if this book was designed for young teenagers, but do not be fooled. This is an awesome read, and probably one of the most exciting novels I’ve read in recent years. I love travelling, and this year I visited some gorgeous places. The perfect weekend getaway, Brighton serves as a lush antidote to the hustle and bustle of a chaotic life in London. We stayed in a lovely AirBnb that was a ten-minute walk from the pier, and our hosts could not have been more welcoming. Thank you, Bill and Ben. I’ve never been much of an outdoors person, but this trek up Kinder Scout rekindled my love of nature. A fantastic birthday weekend with Tom Gough and co. Hoping to visit again next year! Before this year, I had been to America twice, and both visits had been to San Francisco. I’ve dreamed of visiting New York since I was a boy, and 2016 was the year I got to taste the Big Apple. We spent two days in NY and the rest of the week in New Jersey, which was lovely. American Diners all seem to serve the best Iced Tea I’ve ever tasted, and I ate like a king without spending like one. Since the beginning of 2015, I’ve been curating Spotify playlists full of new music I find throughout each year. Friends often contribute to the playlist, but the majority of the music is surfaced by me. This year, I unearthed some wonderful tracks. “Make Me Smile” never fails to turn my frown upside down. It’s not groundbreaking, but it’s great. The rhythms and short pockets of silence in “Sun Spat” are fantastic, and I love the way the drummer sits right at the back of the beat. That’s not a very technical description, but I hope you know what I mean. The rhythm is slightly questionable during the intro of the video above, so I’d recommend listening to the studio recording after you watch it. “Molasses” by Hiatus Koyote is nice and funky, and I love the unconventional song structure. The studio recording is slightly punchier than the video above, but I still enjoy how good they sound live. I can’t believe this track hasn’t had more plays on YouTube. The fun rapport with the audience really makes this recording. The energy of this track is infectious. Again, sounds punchier and tighter in the studio, but this is a great performance. I defy you to listen to “Break Out” without bobbing your head. of Snarky Puppy’s “Family Dinner Volume II” album. them again in a heartbeat. SO. MUCH. ENERGY. A classical jam in a pub that I took part in. I hope to attend again next year. KNOWER are weird and I love them. 2016 was not a good year for exercise. 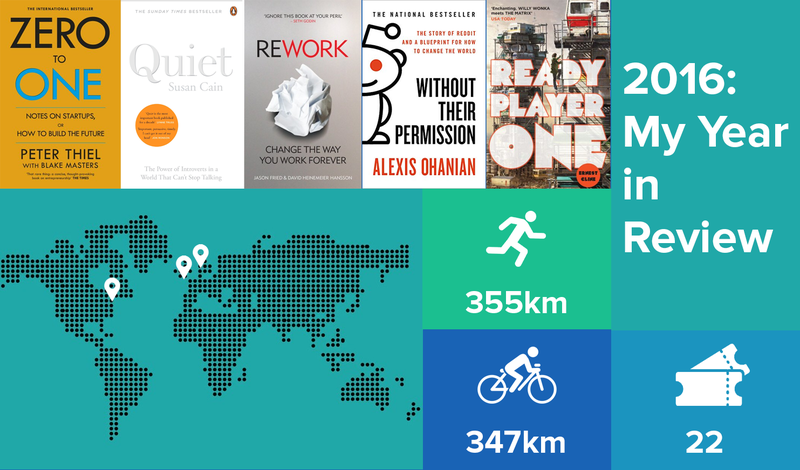 In 2014, I cycled 2265km! I think I’m often guilty of putting my work before my own wellbeing – sleep and exercise tend to be the first to suffer. the Encore network grew from 5,000 to 20,000 musicians! On reflection, 2016 was a fantastic year. I may have failed to achieve some of my goals, but I immersed myself in new places, good music and the company of great friends, and for that I am so thankful. I’m toying with the idea of reviewing each book I read, but I don’t think I’ll have time to do it properly. To finish one book per month, I’ll be switching off electronic devices 30 mins before I go to sleep and reading instead of scrolling through Facebook/Twitter/Medium. Wish me luck! If Mark Zuckerberg can run 365mi in a year, then so can I. My yearly best is 505km, and 600km only works out as 11km per week. How hard can that be? I’ll be immensely surprised if anyone makes it to the end of this post, but if you did, give me a shout on Twitter (@thejamesmcaulay) or in the responses below. Have a great 2017!